Persistence Market Research analyzes the global medical oxygen systems market in a new publication titled “Medical Oxygen Systems Market: Global Industry Analysis and Forecast, 2016–2024”. This study provides data for 2015 along with the forecast for the period 2016–2024. The main objective of the report is to identify dynamics in the market and provide recent updates and insights affecting various segments of the global medical oxygen systems market. To provide better understanding of the market, the report also includes an analysis of drivers, restraints, and trends on all five regions namely, Asia Pacific, North America, Europe, Latin America and the Middle East & Africa which influence the current market scenario and future status of the global medical oxygen systems market over the forecast period. This report covers the global medical oxygen systems market performance in terms of revenue contribution from various segments. The global medical oxygen systems market report begins with an overview of medical oxygen systems and key definitions. This section also underlines factors influencing growth of the global medical oxygen systems market along with a detailing of the key trends, drivers, restraints, and opportunities. Impact analysis of key regional growth drivers and restraints based on the weighted average model along with key region-specific trends is included to better equip clients with information and hidden insights. At the end of the report, Persistence Market Research has provided key strategic recommendations for both existing and new players in the global medical oxygen systems market to emerge sustainably profitable. The global medical oxygen systems market is segmented based on product type, modality, end user and region. On the basis of product type the market has been segmented as Compressed Oxygen Cylinders, Oxygen Concentrators and Liquid Oxygen System. On the basis modality the market has been segmented as portable oxygen system and standalone/stationary oxygen system. On the basis of end user market has been segmented as hospitals, emergency medical centers, ambulatory surgical centers and home care settings. A detailed analysis has been provided for every segment and sub-segment in terms of market size, Y-o-Y growth rate, absolute $ opportunity, market attractiveness index and BPS analysis. The next section of the report highlights the growth trends of the global medical oxygen systems market by region. It provides a market outlook for 2016–2024 and sets the forecast within the context of the global medical oxygen systems market. The study analyzes the extent to which drivers are influencing this market in each region. In the final section of the report, a competitive landscape has been provided to present clients with a dashboard view of various comparison points including revenue bracket, key strategies, and global presence amongst others. It also enables identification and evaluation of key competitors based on an in-depth assessment of their capabilities and success in the marketplace. Moreover, the company market share analysis of the top companies in the global medical oxygen systems market has been analyzed. In order to offer an accurate forecast, the report starts by sizing the current market, which forms the basis of how the global medical oxygen systems market will grow in the future. In addition, it is imperative to note that in an ever-fluctuating global economy, the report not only conduct forecasts in terms of CAGR, but also analyzes the market on the basis of key parameters such as year-on-year (Y-o-Y) growth to understand the predictability of the market and to identify the right opportunities across the market. As previously highlighted, the global medical oxygen systems market is split into a number of segments. All segments in terms of product type, by modality, by end user and based on different regions are analyzed in terms of basis point share to understand individual segments’ relative contribution to market growth. This detailed level of information is important for identification of various key trends likely to influence the global medical oxygen systems market. Also, another key feature of this report is the analysis of all market segments in terms of absolute dollar opportunity. This is traditionally overlooked while forecasting the market. However, absolute dollar opportunity is critical in assessing the level of opportunity that a provider can look to achieve, as well as to identify potential resources from a sales and delivery perspective in the global medical oxygen systems market. 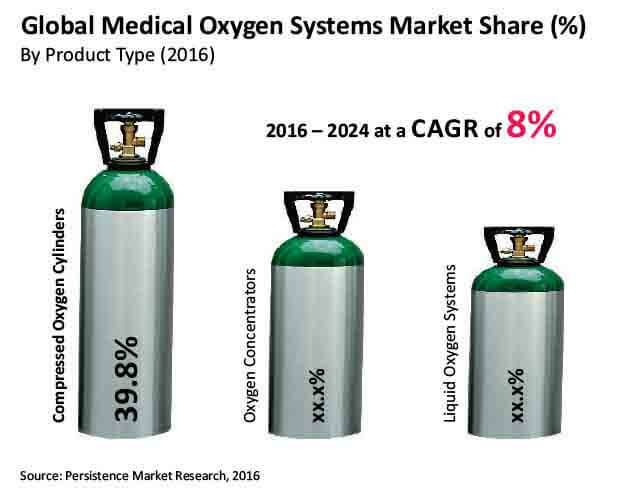 Persistence Market Research forecasts the global medical oxygen systems market to grow from nearly US$ 2,000 Mn in 2015 to almost US$ 4,000 by 2026 end. This represents a CAGR of 8.0% over the forecast period. The global medical oxygen systems market is likely to represent absolute $ opportunity of approximately US$ 200 Mn in 2017 over 2016 and incremental opportunity of nearly US$ 2,000 Mn between 2016 and 2026. Compressed oxygen cylinders segment is the largest segment among the medical oxygen systems market product segments, which was estimated to create nearly US$ 900 Mn or 39.8% share of the total market in 2016 and nearly US$ 1,500 Mn or 36.9% share by 2024, registering a CAGR of 7% over the forecast period. Oxygen concentrators is the fastest growing segment, which is expected to grow from nearly US$ 700 Mn in 2016 to nearly US$ 1,200 Mn by 2024 over the forecast period. Liquid oxygen systems segment is expected to register a 9.4% CAGR over the forecast period and be valued at nearly US$ 1,300 Mn by 2024 end. Compressed oxygen cylinders segment is expected to create absolute $ opportunity of approximately US$ 60 Mn in 2017 over 2016. By the end of the forecast period, compressed oxygen cylinders segment is projected to reach nearly US$ 1,500 Mn, registering a CAGR of 7%. Compressed oxygen cylinders segment revenue in the global medical oxygen systems market is expected to grow 1.7x by the end of the projected period as compared to that in 2016. Oxygen concentrators segment is expected to create absolute $ opportunity of approximately US$ 50 Mn in 2017 over 2016. By the end of 2024, oxygen concentrators segment is projected to reach nearly US$ 1,200 Mn, witnessing a CAGR of 8% over the forecast period. Oxygen concentrators segment revenue in the global medical oxygen systems market is expected to grow 1.8x by 2024 end as compared to that in 2016. Liquid oxygen systems segment is expected to create absolute $ opportunity of nearly US$ 50 Mn in 2017 over 2016. By the end of the forecast period, liquid oxygen systems segment is projected to reach nearly US$ 1,300 Mn, witnessing a CAGR of 9.4%. Liquid oxygen systems segment revenue in the global medical oxygen systems market is expected to grow 2x by 2024 end as compared to that in 2016. Liquid oxygen systems segment dominated the global medical oxygen systems market in revenue terms in 2015 and is projected to continue to do so throughout the forecast period. Liquid oxygen systems segment is the most attractive segment, recording an attractiveness index of 1.1 over the forecast period. Compressed oxygen cylinders segment accounted for 40.0% value share in 2015 and is expected to decline to account for 36.9% share by 2024 end. Compressed oxygen cylinders segment is expected to be the second most lucrative segment in the global medical oxygen systems market, with an attractiveness index of 1.0 during the forecast period. With the proliferation of large size and standalone devices there is likely to be a fall in the demand for compressed oxygen cylinders over the forecast period as compared to oxygen concentrators and liquid oxygen systems.